After Maju Expressway, SMART Tunnel, DUKE Highway, Karak Expressway, LATAR Expressway, Kajang SILK Highway, Guthrie Corridor Expressway, Besraya Expressway and AKLEH Highway, it’s now the turn of the New Pantai Expressway (NPE) to raise toll rates, according to The Star. The highway connecting Bangsar to Sunway will now charge significantly more at two of its three toll plazas. From October 15, 2015, the new toll rates are RM2.30 (up 70 sen) for Class 1 (passenger vehicles), RM4.60 (up RM1.40) for Class 2 (small lorries), RM6.90 (up RM2.10) for Class 3 (large lorries) and RM1.20 (up 40 sen) for Class 4 (taxis); Class 5 vehicles (buses) remain charged at RM1.60. These are applied at both the PJS 5 toll plaza near Sunway, as well as the Pantai Dalam toll plaza heading towards Bangsar. 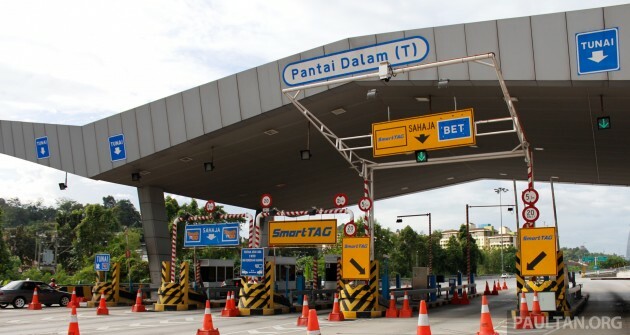 The PJS 2 toll plaza that connects Jalan Klang Lama to Sunway and Federal Highway retains its current toll rates at RM1.00 for Class 1, RM3.20 for Class 2, RM4.80 for Class 3, RM0.80 for Class 4 and RM1.60 for Class 5. I am happy it has gone up. At least now, our Government has more money for the nation. Thank you BN. I am not being sarcastic but sincerely thank our Government for this increase. I am happy to give. To all those not happy, pls pack your bags and leave! Hooray! This is the way to becoming a high income nation. Before you can earn more you must first pay more for everything. LOL. You have to live like you can afford it, so that you can only afford it in the future. Just like what ppl says, you need to act like a leader, so that you will become a leader in the future. I used both tolls everyday to work! KNNCCB! Don’t complain lah! Be grateful you are living in a safe and lovely country! To the Red shirt rallies participants, congratulations! Thanks for your support for price increase. like tat no more roti canai kosong for me in the morning hour, i bring my own gardenia bread slice to work then. kopi 3in1 one pack instead of teh tarik then. ok one.